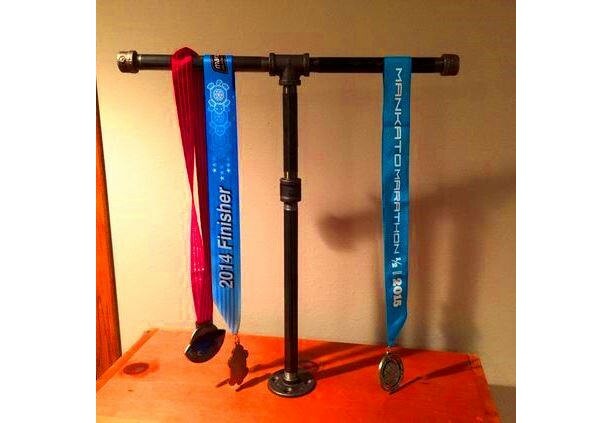 Table Top, Desk Top, industrial black pipe Marathon, 26.1, Half Marathon, 13.1, 10 K, 5 K, Sprint Tri, Tri, Iron Man Medal Display Stand, Rack. Beautiful and unique way to display all of your hardware. Hand made heavy duty 1/2" diameter industrial black pipe construction can easily hold over 30 medals. Great conversation and eye catching piece for your fitness room, office desk or anywhere you want to show off all of the racing bling that you've worked hard to collect. The medal holder measures approximately 22" tall, 18" wide and weighs approximately 5 pounds (without medals). Our exclusive running medal display turns your race medals into a work of art. It's a beautiful display and a great conversation piece! So, get all those hard-earned race medals out of the drawers and onto this innovative and attractive display. This innovative design allows you to hang over 30 race medals! Create a race medal display that is guaranteed to get a lot of compliments. 100% satisfaction guaranteed or your money back. Some assembly required. ***For larger orders (10 or more), we can discount our pricing 10%. Please message me with your request and I'll be happy to supply you with a free quote. Wholesale orders are also welcome.